We are loving the unseasonably hot weather we are having at the moment (there were a few red noses in the Office Monday morning, please don't forget that sun cream guys!!!) and it started us thinking about long lazy days in the garden. Once all of the those pesky weeds have been pulled out, the bushes pruned and the lawn mowed why not sit down and relax after all that hard work, you deserve it. 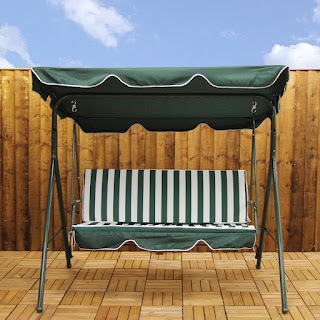 We have chosen a few of our favourite garden furniture lines to share with you, but they won't be around for long so snap them up now to avoid disappointment. This Tropicana 5 piece garden furniture set comes with table, 2 benches and 2 armchairs and is perfect for any patio area or garden. 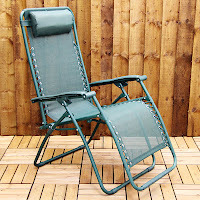 This set is as ideal for large bbq gatherings as it is for a lazy Sunday lunch in the garden, and at only £199.99 you don't have to stress about the price. To co-ordinate we also have the 2 seat garden bench for just £49.99, perfect to put under a tree or just in your favourite spot in the garden. 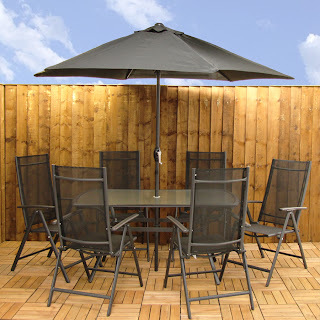 This is the Santorini 8 piece garden furniture set, for just £249.99 it comes with a table, 6 chairs and a crank handle parasol. This set will add a contemporary look to any garden or patio. For a little added luxury and the ultimate in "ME" time this 3 seat padded hammock is perfection. It is just £69.99 (WOW!!!) so you will definitely be sitting comfortably, though the only thing you will be ready for is a quick 40 winks we think!! 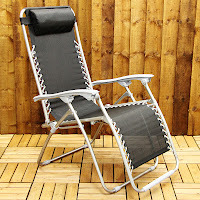 Sun worshippers will love these multi position textoline garden relaxers, with a padded headrest, they are perfect for lounging. There is a choice of black or green and at just £29.99 each why not treat yourself and your partner?? Just don't forget the Factor 20!! 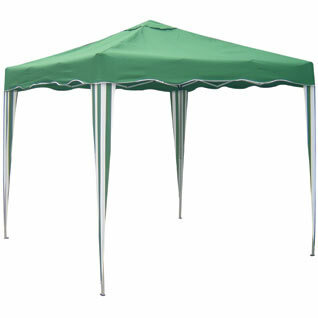 For those who prefer a little shady cover this instant pop up gazebo has no poles and requires no tools and goes up in minutes. At just £39.99 it is a must for anyone planning a barbecue this year or to keep the little ones out of the sun.